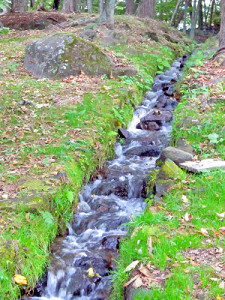 Settled on the slope of the gentle hill, Sanbu Ichiyusui is a small weir built to divide the flow of rich water into 3 areas when there were conflicts on water for farming among villages. 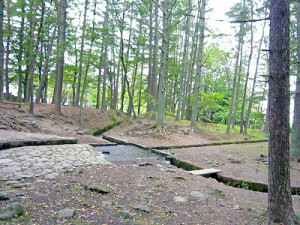 There is a legend that the famous Kai provinceW (Yamanashi) warlord of Sengoku eraW (end of 15th century to the end of 16th century), Shingen Takeda, who is known for his wisdom, had built as you can see by the flow system utilizes wisdom and innovative ideas setting triangle stone in the main pool. 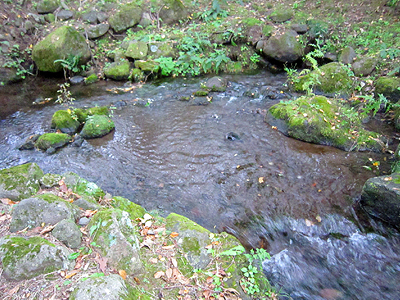 The water rus and springs from Southern Yatsugatake Volcanic GroupW in volume of about 8,500 tons a day. 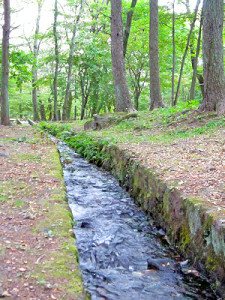 The weir is surrounded by meadow and a small park so that you can take a little walk hearing the sounds of water flowing which is very relaxing. 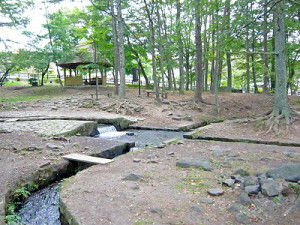 Address : 292-1 Koarama, Nagasaka-cho, Hokuto-shi, YAMANASHI Pref.